Begin on your hands and knees. Align your wrists directly under your shoulders and your knees directly under your hips. The fold of your wrists should be parallel with the top edge of your mat. Point your middle fingers directly to the top edge of your mat. Stretch your elbows and relax your upper back. Spread your fingers wide and press firmly through your palms and knuckles. Distribute your weight evenly across your hands. Exhale as you tuck your toes and lift your knees off the floor. Reach your pelvis up toward the ceiling, then draw your sit bones toward the wall behind you. Gently begin to straighten your legs, but do not lock your knees. Bring your body into the shape of an "A." Imagine your hips and thighs being pulled backwards from the top of your thighs. Do not walk your feet closer to your hands — keep the extension of your whole body. Press the floor away from you as you lift through your pelvis. As you lengthen your spine, lift your sit bones up toward the ceiling. Now press down equally through your heels and the palms of your hands. Firm the outer muscles of your arms and press your index fingers into the floor. Lift from the inner muscles of your arms to the top of both shoulders. Draw your shoulder blades into your upper back ribs and toward your tailbone. Broaden across your collarbones. Rotate your arms externally so your elbow creases face your thumbs. Engage your quadriceps. Rotate your thighs inward as you continue to lift your sit bones high. Sink your heels toward the floor. Align your ears with your upper arms. Relax your head, but do not let it dangle. Gaze between your legs or toward your navel. To release, exhale as you gently bend your knees and come back to your hands and knees. Sometimes, no matter how much you love your work or your life, the afternoon slump can really take you off track with the sleepies and the "blahs". (Very technical terms - I know). 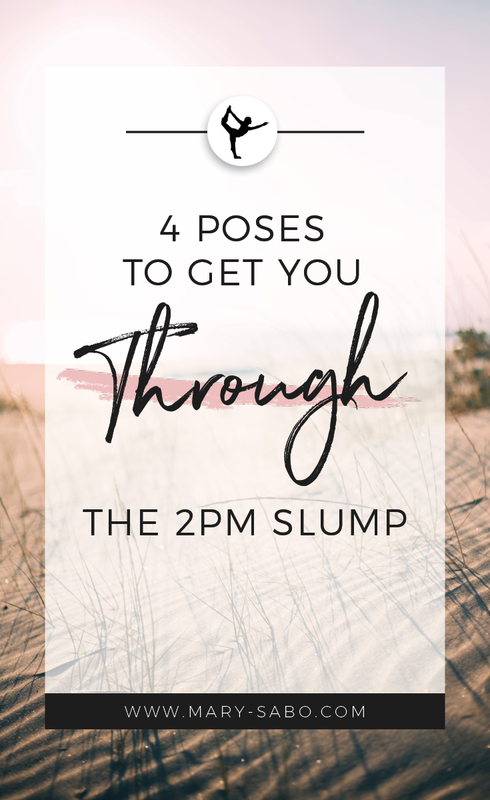 Here is a 4-pose sequence to get you through that time of the day so you can finish strong! Begin on your hands and knees. Align your wrists directly under your shoulders and your knees directly under your hips. The fold of your wrists should be parallel with the top edge of your mat. Spread your fingers wide and press firmly through your palms and root down through your index knuckle and thumb knuckle. Distribute your weight evenly across your hands. Exhale as you tuck your toes and lift your knees off the floor. Reach your pelvis up toward the ceiling, then draw your sit bones toward the wall behind you. Gently begin to straighten your legs without locking the knees. Press the floor away from you as you lift through your pelvis. As you lengthen your spine, lift your sit bones up toward the ceiling. Relax your head and allow your ears to align with your inner arms. Gaze between your legs or toward your navel. Stand straight. Separate your feet comfortably wide apart (about 31/2 to 4 feet) and turn your right foot out 90 degrees and left foot in by 15 degrees. Now align the center of your right heel with the center of your arch of left foot. Distribute the weight of your body equally between both feet. Inhale deeply and as you exhale, bend your body to the right, downward from the hips, keeping the waist straight, allowing your left hand to come up in the air while your right hand comes down towards the floor. Rest your right hand on your shin, ankle, or the floor outside your right foot, whatever is possible without distorting the sides of the waist. Stretch your left arm toward the ceiling, in line with the tops of your shoulders. Keep your head in a neutral position or turn it to the left, eyes gazing softly at the left palm. Ascertain that your body is bent sideways and not backward or forward with pelvis and chest are wide open. As you inhale, come up, bring your arms down to your sides, and straighten your feet. From mountain pose, firmly root down through your left foot as you lift and place the sole of your right foot firmly on your inner left thigh or calf. Place your hands in prayer over your heart pressing the palms together and focusing on your drishti (focal point) out in front of you. Ensure your spine is straight and take 10 breaths on each side. Begin in Utkatasana (chair pose) with both legs bent and your arms by your sides. Transfer your weight to your left foot. Lift your right foot up off the floor. Cross your right thigh over your left thigh as high up the thigh as possible. Hook your right foot around your left calf. Bring both arms out in front of you and parallel to the floor. Lift the elbows to the height of your shoulders while keeping the shoulders sliding down away from your ears. Keep your spine perpendicular to the floor and the crown of the head rising. Hold 10 breaths on each side.